IIM Ahmedabad, Ahmedabad, India 380115. Millennials are facing the scariest financial & career future of any generation since the Great Depression. No matter how good strategy you follow, if you are not an optimist in life you would never be successful. An optimist sees challenges as temporary, and as stepping stones that are leading them to a better solution, whereas a negative person gets stuck and blocked. This will provide with techniques to dejunk one’s mind, get a clear sense of the life purpose and overcome failure & happiness mind pattern technique with role play with various tools like food / wellbeing, stories, failures talks, management lessons, business optimism theory, exercises, brain positive technique, science of happiness. He is currently the Vice President at Paytm and heads the Paytm – Make for India, an initiative to promote the grass root innovations in the country. He is also the founder of Fun2Do labs, an open education project and Mentor – Digital Business at Delhi Press Magazine. He had authored two books on mobile phone programming and holds several patents to his name. He was given the title “Blackberry Elite” by Blackberry and “Nokia Developer champion” by Nokia. Built around the core idea of “Be the change you wish to see in the world!”, Anar Patel’s life journey is the reflection of her aspiration and desire to catalyze social change through sustainable means. Love, trust and faith, are three core values that have woven her life journey in service, thread by thread. Anar Patel, an ardent social change maker, an MBA from Institute of Management, NIRMA University, is engaged in service for over 30 years now. She has been the pillar and driving force of many organizationsserving and empowering different sections of society. She co-founded the NGO, Manavsadhana, with the philosophy of “Love all, serve all”, in 1990. To enable women to be the catalyst of sustainable economic and social change in order to strengthen their families and positively impact their communities, in 1995, Anar Patel founded a non-profit organization Gramshree. In 2010, with the mission to revive, preserve and promote the craft traditions of India and to empower the handicraft artisans from across the country, Anarben Patel founded “Craftroots”. Anar Patel has been honored with the prestigious ‘All Grassroots Women of the Decade Achievers’ Award for her phenomenal contribution and commitment towards sustaining the lives of many women and children in Ahmedabad by Assocham Ladies League (ALL). She received the ‘Gujarat Gaurav’ Award for her outstanding rehabilitation work in Kutch in 2001. In 2016, She inspired, conceptualized and created first of its kind city festival in India “Sabarmati Festival” with the aim to celebrate the cultural diversity and inclusiveness of Ahmedabad. Apart from this Anar Patel is also trustee and mentor to many other organizations such as YUVA Unstoppable, Seva Café, ESI, Moved by Love, and is engaged in various social upliftment and welfare activities. She recently has been appointed as the chairperson of Khadi and Handicraft Promotion committee of Business Women’s Wing of Gujarat Chamber of Commerce. 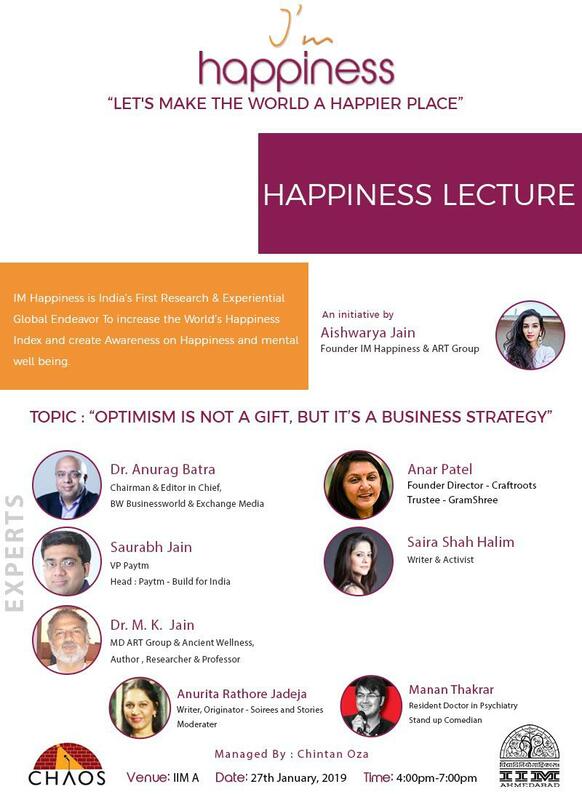 IM Happiness is India’s First Research & Experiential Global Endeavor To Create awareness on Happiness. 1 in 5 people across the globe is unhappy. Happy people get more successful across multiple life domains, including marriage, relationships, health, longevity, income, and academic and work performance. They are better able to multitask and endure boring tasks and are more creative, trusting, helpful and sociable. IM Happiness aims to increase happiness by authenticated tools in happiness, in life, in relationships, at work, at home, in career, in business, in families, lifestyle and more. They do this by collaborating with the world’s best researchers, teachers, and spreading their theories through our impactful initiatives. They utilize the genesis of psychology, Ayurveda, scientific research, research tests, ancient secrets, philosophical teaching and more.